Did you know that the cherries found in cocktails, canned fruit cocktail, or on top of your ice cream aren't "real cherries"? To be perfectly honest, I had no idea until I arrived in Australia and tasted real and natural cherries. Apparently, maraschino cherries or decorative cherries undergo a process of bleaching and preservation with sulfur dioxide and calcium chloride and then soaked in food coloring, corn syrup and others. Real cherries taste nothing like it! In fact, here's a beautiful pair, freshly picked by myself. I had been meaning to go strawberry picking at Beerenberg like I previously mentioned but haven't quite gotten around to it. Fortunately, cherry picking season is around the same time between November to January. (This varies and orchards will often announce when the last day for picking will be.) We visited around late December on a perfectly cool and cloudy day which was a relief from the Australian summer heat waves. 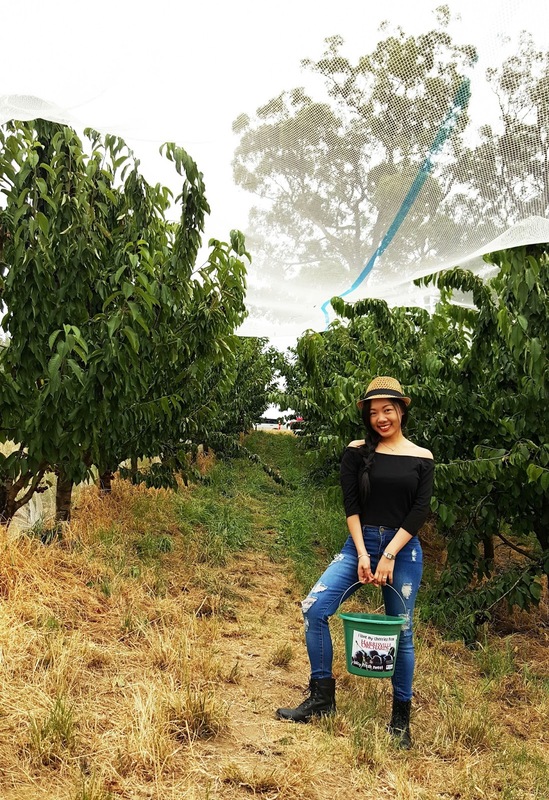 We drove up to Harrisville Orchards located on 72 Harris Road, Lenswood, South Australia. I have to admit, we drove past tons of signages for other orchards as we were driving to Harrisville. The reason I picked this one is because well, I'm new to Adelaide, and this was the first one I heard of. Lol. An acquaintance was carrying their bucket around and told us that the orchard was only 30 minutes away from the city. And google maps said that it was around 30 minutes drive. Uhm. It definitely took more than 30 minutes on narrow, windy roads to get there but it wasn't bad. The entrance fee cost us $5 per person which included a complimentary bucket. Taking home the cherries cost $5 per kg of extra large cherries. We filled up almost 2 full buckets and it only cost us about $28. 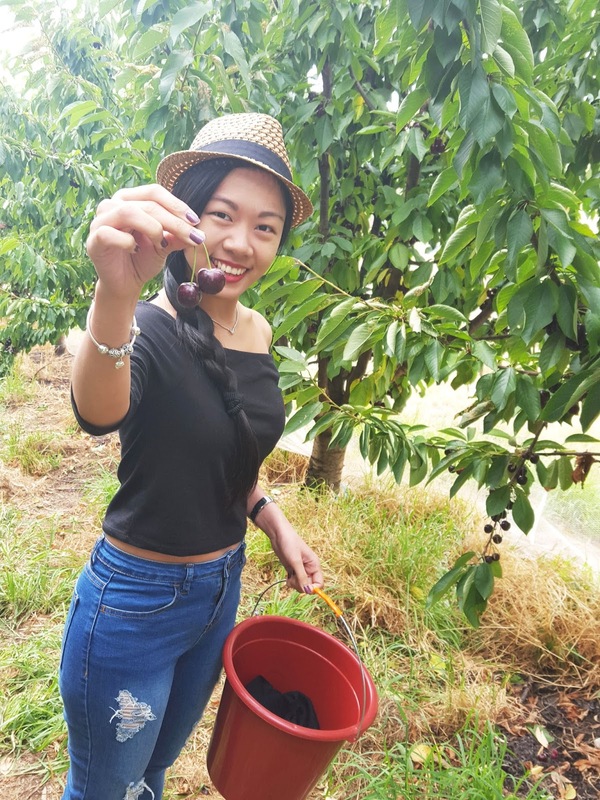 Like I said, there are tons of other orchards around Adelaide that offer cherry picking at different rates so you might want to check around before deciding. But I was perfectly happy about my day. 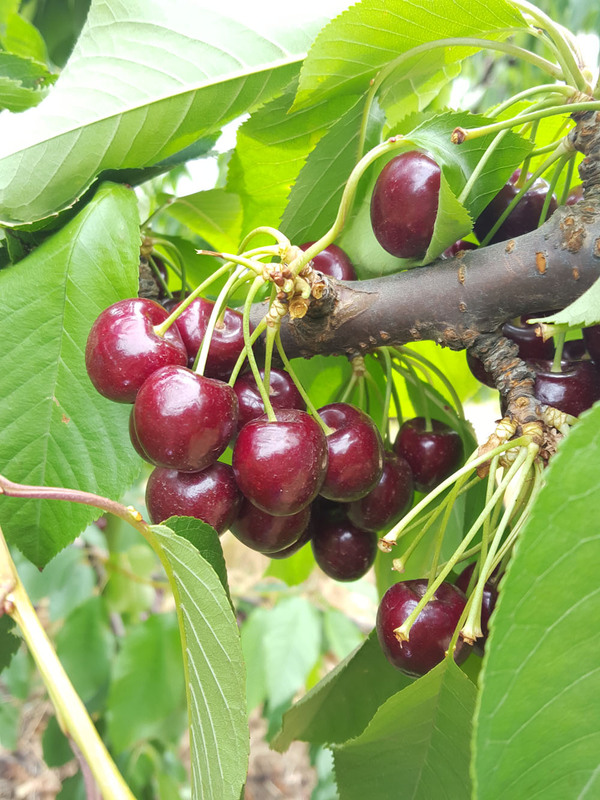 We were instructed that the way to pick cherries is to include the stem. Otherwise, if you pick them without including the stem, they won't last very long. And no, the purpose of including the stem is not so you could tie a knot with your tongue. The trees branches are flexible and easily bent too so you can easily reach the literal "cherry on top". Harhar. This is a perfect family activity that kids also enjoy - watch out for the cherry wars though! And if you want to stay longer, bring a snack or a picnic basket so you can enjoy lunch with some cherries for dessert. Have you been cherry picking before? Looks like you had a lot of fun! Great post! Wow! That is really cool thing to know and it seems you enjoyed cherry picking. Thanks for commenting on Qing's Style. I hope you always keep in touch! This seems soo fun I want to go cherry picking someday! What a cool place it will be hard for me who loves cherry to be picking without eating them lol. You look amazing Jeanne cool hat. Lovely post! This looks like fun! I've never been a fan of maraschino cherries. Definitely prefer the real thing! I've never been cherry picking though, it sounds like so much fun! And you look so great in that outfit! Love the off the shoulder top. Yes, I've done it before and also strawberry and grape picking at summer and late summer. I love doing outside activity and eat some fresh and ... bio fruits! I guess you had fun! I'd love to go cherry picking! This looks so much fun! It's been awhile since I went cherry picking and this makes me want to go to an orchard! The cherries look so yummy! This looks so cool! Nice outfit for cherry picking. You looke like you had an awesome time!! How fun, It sure is a great way to spend the day. You look lovely. Cherry picking looks so much fun. I've yet to try it. Love your off the shoulder top with your braided hair. You look so pretty. 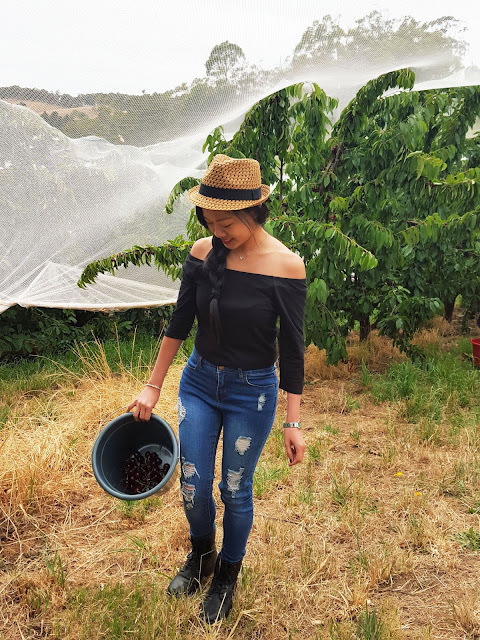 I've just followed you on instagram and Bloglovin after reading this post, I really enjoyed it and those Cherries look amazing! omg that sounds like so fun! gorgeous photos!! That is such a lovely activity and nice way to spend time outdoors. You look very pretty Jeanne! I miss cherry picking! Lovely pictures babe. SO refreshing! This looks like so much fun! I love your off the shoulder top with the higher waisted jeans. My mom will definitely LOVE this place! This is giving me a trip down memory lane! I grew up with an orchard in the "backyard" so I often went there to pick apples, pears, blackberries and cherries. We had several cherry trees all around the property, and it was so much fun picking and eating directly from the tree! Granted, ours were a bit sour, but it was still a favorite activity of mine. I love cherries, yummy. Looks like you had a lot of fun. Love your outfit, cute. Oh, I want summer too! Great pictures! I love cherries! How cute are you here, lady? What fun! I love picking strawberries and blueberries, but I've never picked cherries before. It looks like such an amazing time! That is such a cute outfit to go picking cherry in. In can't believe they give us fake cherries on cakes and icecream, I am so offended!! I can't believe you only paid 28 dollars for two whole buckets, that is so cheap for those amazing fruits. I am officially coming to Australia soon! Looking so pretty! Those jeans look perfect on you! Aww what a lovely idea for a day out! I had no idea that cherries tasted different, so strange! I'm going to look and see where my nearest strawberry field is now so that we can go in the summer! Cool, how I wish there's such activities in Singapore! Great pictures, I love cherries!! You look like you had a great day :) Can't believe you'd never had real cherries before! Such a great thing to do on the weekend. I haven’t been fruit picking in ages but thanks for giving me an idea for when I’m bored! Love the photos. Looks like you had fun & the cherries look delicious! Wow this looks so amazing!!! Next step: Cherry Pie.